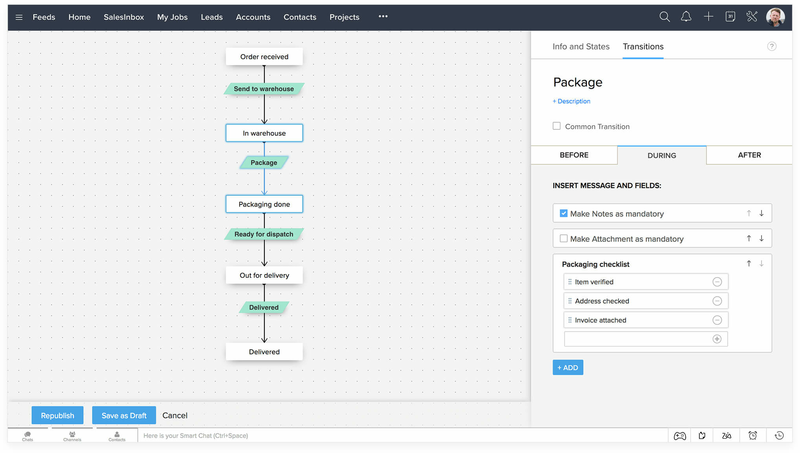 Checklists, SLAs for States and more enhancements in Blueprint! Save a Draft Version of your Blueprint’s Process Flow! 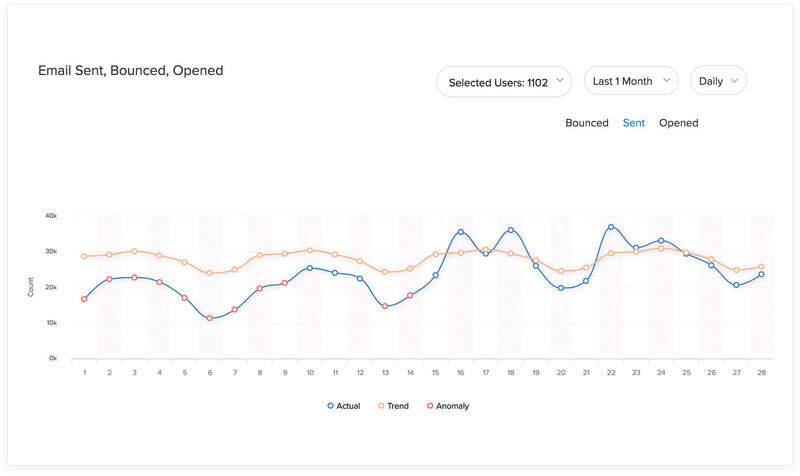 Call queue: You can now queue up to 25 incoming calls while receiving calls via Twilio. Maximum waiting time for the calls in the queue is 25 minutes. Call hold, resume, and mute: Put your call on hold by clicking the Hold icon on the call pop-up. Click it again to resume your call and also mute your call, if needed. 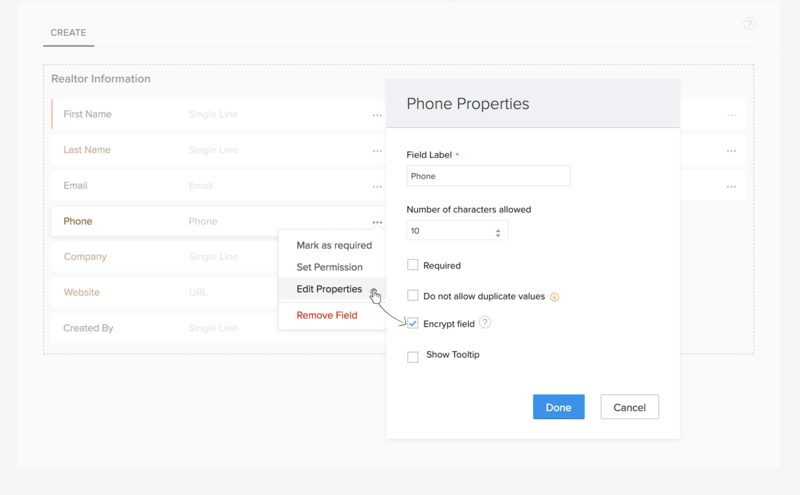 Call preferences: Save your preferences to easily identify your callers to your Twilio numbers while making outbound calls. Multiple reminder support for events. You can now add, delete or re-authenticate your personal social media accounts from the Personal Settings page in Zoho CRM. An interactive CRM is all you need to make your business smarter. 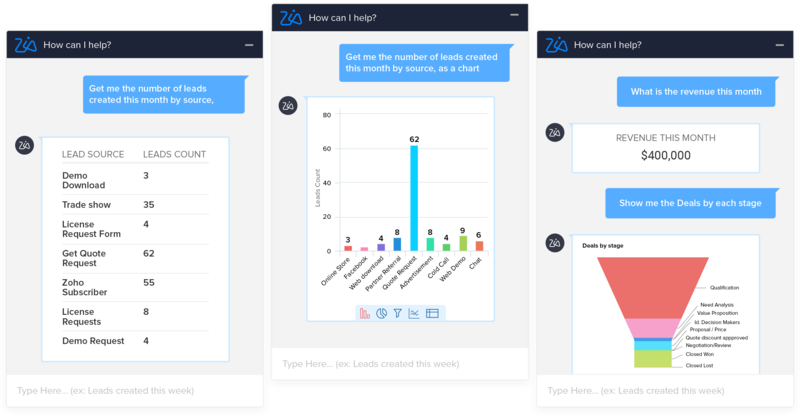 The first conversational AI for sales teams, Zia Voice lets you talk to your CRM through voice or chat. Get access to CRM information that's timely, contextual, and available, right when you need it. An assistant is someone you can always count on. 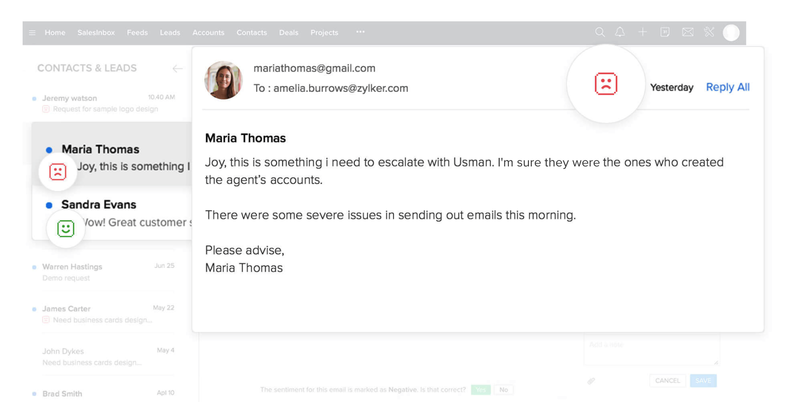 Your CRM assistant should be no different. 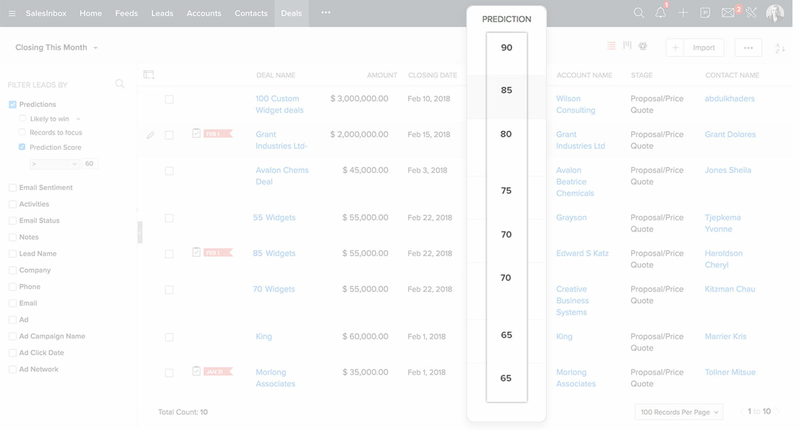 Zia can now predict your lead or deal closures, read email sentiments, and alert you to use the best time to contact a prospect, which she has suggested. What's smarter? 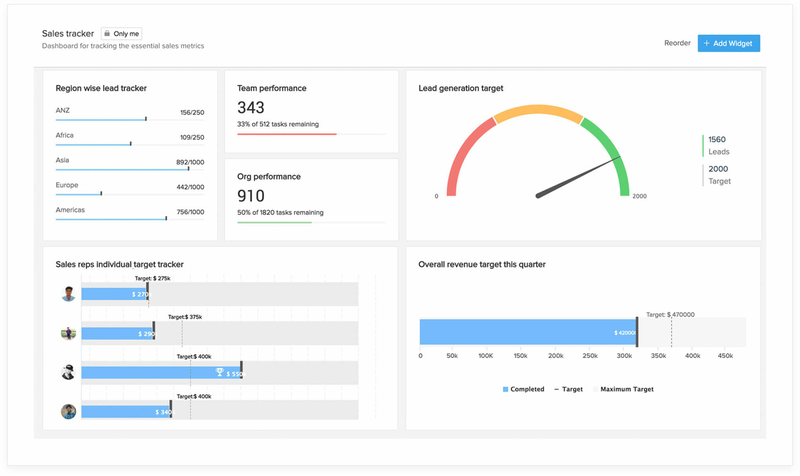 She also intelligently analyzes the performance of your workflow automation, provides a dashboard that has intelligent components, helps you map your current trends as compared to expected results, along with auto-populating lead information in your CRM, so you spend less time on data entry. Time is money, especially when you're making a sale. 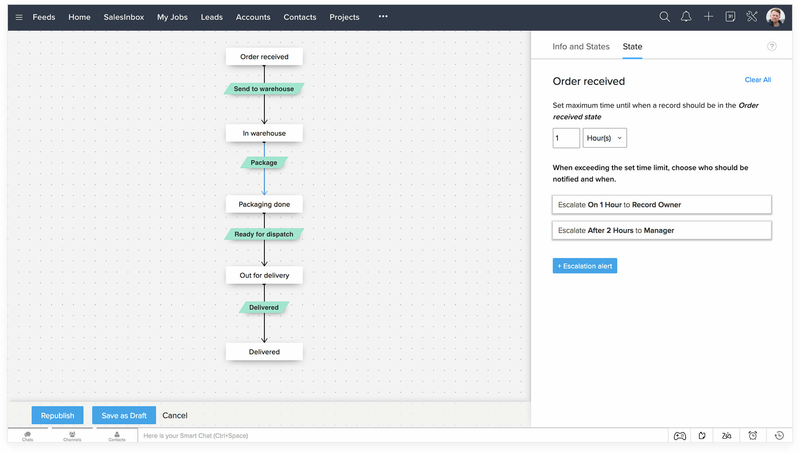 Blueprint in Zoho CRM helps you build and automate your sales process just like you designed it. Blueprint's newest functionality? The ability to mark all tasks complete before salespeople move to the next stage along with specifying the time a record should be in a particular state for. 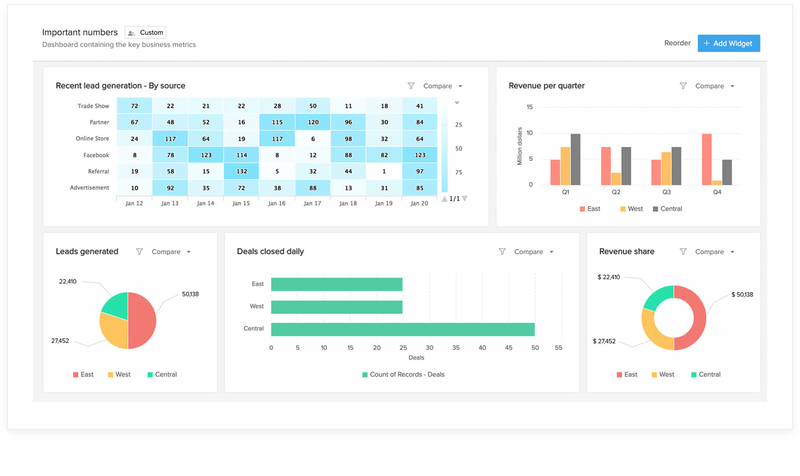 Zoho CRM's user dashboard gets a brand new interface, with the addition of 5 new analytical widgets that will redefine how sales teams draw business insights. 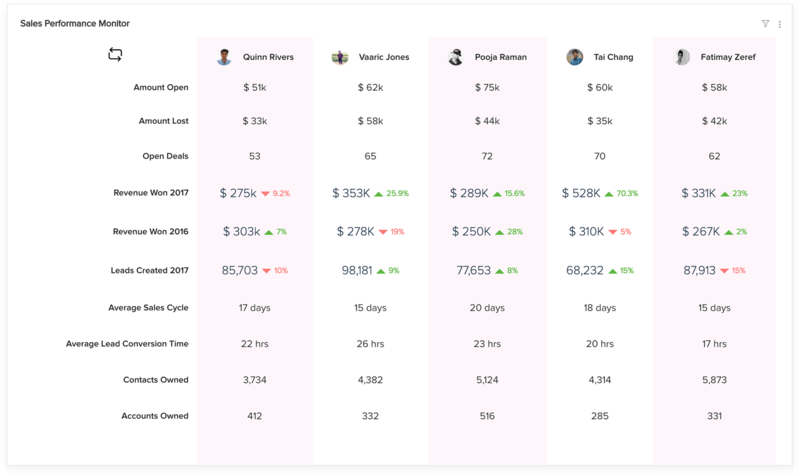 Get your own customizable dashboard that will help you track sales metrics and visualize key performance indicators. Stay on top of sales trends by detecting anomalies in your sales cycle, or compare peer-to-peer performance or deal closure cycles with the help of the Spot Comparator. Keep your sales team close, and your customers closer. 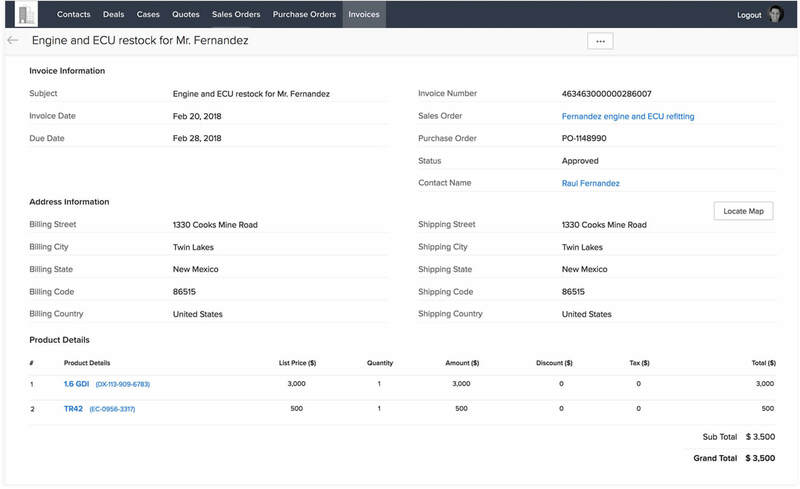 With access to all past purchases, cases, and invoices, Portals allows your customers, vendors, and partners to make more informed buying decisions. 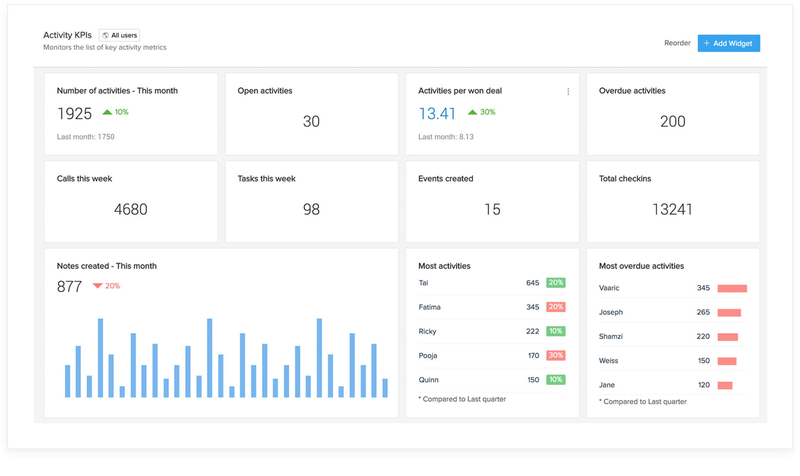 One of our biggest releases this year for Developers, CRM administrators, and IT implementors. Catalyst, a hyper-customization platform, allows you to build custom applications on your CRM platform and replicate your unique business needs and processes. Build customized mobile applications based on your specific roles and needs, with CRM data. Create your own version of web applications that reflect your business requirements. Distribute mobile apps to your team created through mobile SDKs. without having to worry about physical hardware or server administration. Build your own UI components that not only fetch contextual information from external sources, but also work with Zoho CRM's data. 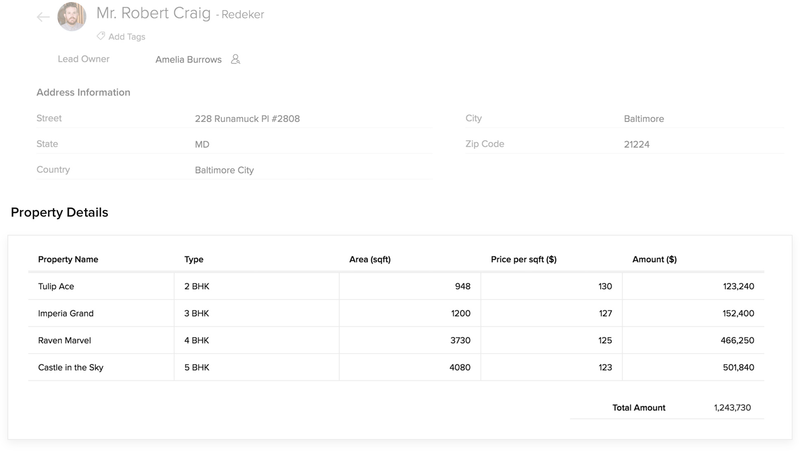 Your traditional data arrangement with CRM gets a twist. 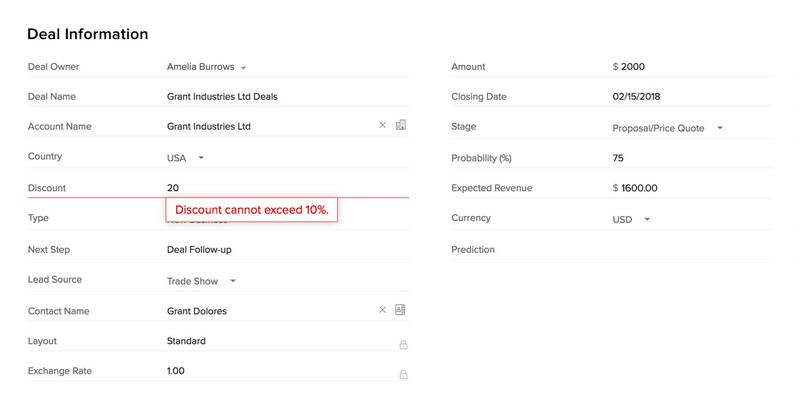 Customize the List View of your Zoho CRM account with the industry's first-of-its-kind view. 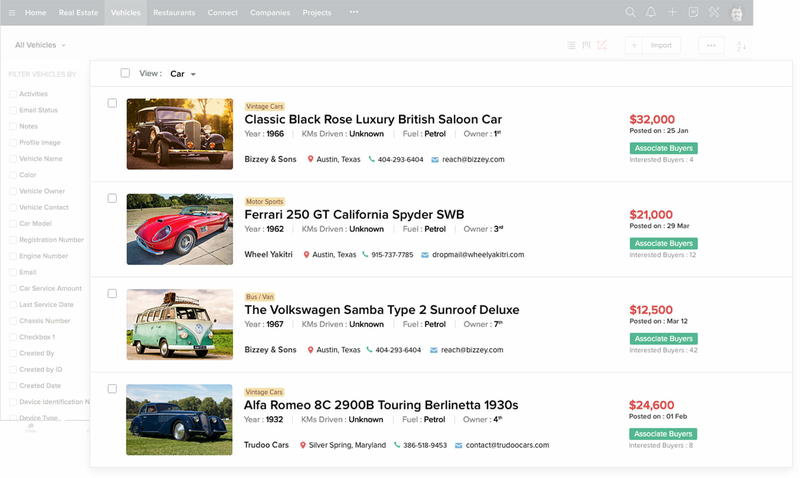 Add images for easy identification, use custom buttons to create fields of your choice, and get your view completely customized based on your business needs. Simplify the way you view CRM information with Subforms in Zoho CRM. 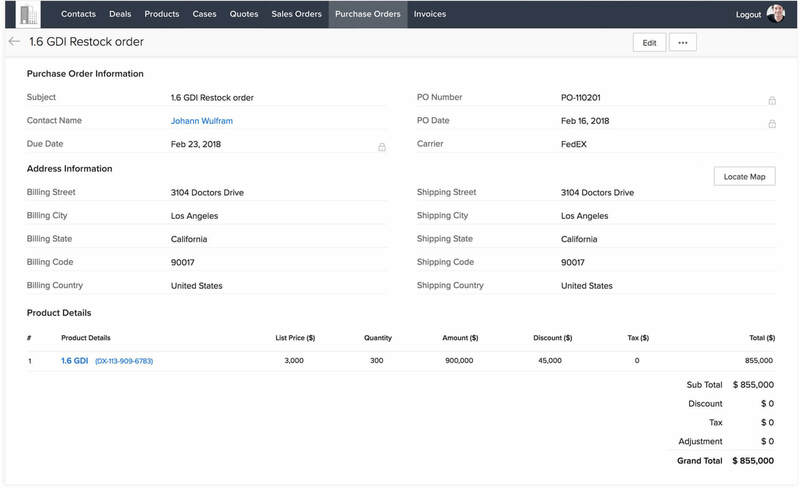 View the entire order history of a single customer, in one single place. 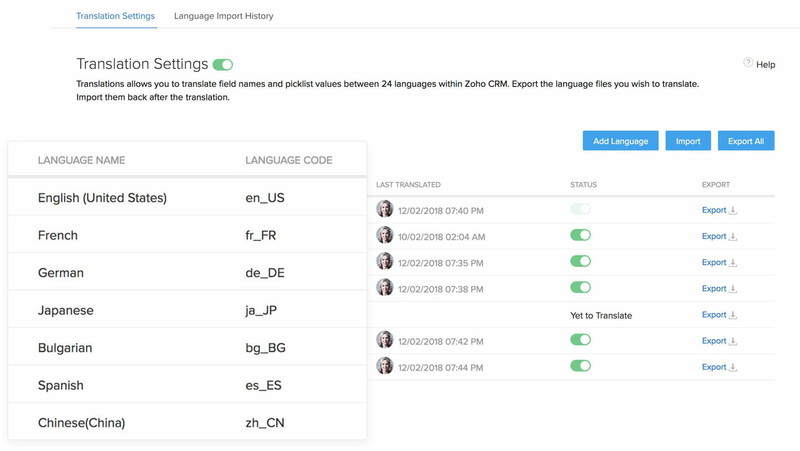 With Translations, your CRM information is available to your team in the language they're most comfortable with, keeping that local flavor of every business intact. Frame different rules for different modules and fields, along with error messages that should show up when invalid data tries to enter your CRM. Zoho CRM uses one of the strongest encryption standards, AES-256, to encrypt your data. This means your data is protected from outside access, and can be read only if decrypted. By encrypting your data that's stored in Zoho CRM, we prevent any possible security leaks or breaches to your data. Set up web conferences to follow up with clients inside CRM. Every new event, or meeting, contains a details page in Zoho CRM, where your team can access the audio-video recording of the conference and relevant documents shared during the meeting.